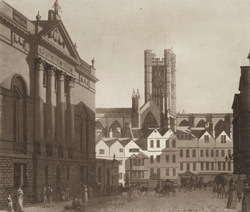 The Guildhall, situated in the High Street, was built between 1766 and 1775 by Thomas Baldwin. The west front had five bays, a pedimented portico and a rusticated ground floor. As can be seen in the print, the parapet is decorated by stone vases, with a figure of Justice is perched on the top of the pediment. Behind the Guildhall buildings are the markets. New wings and a saucer-shaped dome were added by JM Brydon in 1891. Bath Abbey church can be seen in the background.